With Reign's threat to Earth apparently contained Kara decides to move home to Argo City -- unaware that the Dark Priestess cult is not yet finished with their endgame. J'onn learns that a version of the D.E.O. 's powerful weapons have hit the streets of National City. Last edited by GateWorld; June 14th, 2018 at 01:14 PM. Interesting episode. I honestly don't know how the DEO will function without lethal weapons. I guess we shall see. 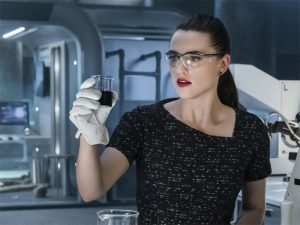 I wonder what Lena saw as she was working on the black rock for Kara? That's going to be an interesting story.. Obviously, it's the writer's attempt to comment on the current anti-gun hysteria, but which way will it go? I expect it will fail miserably for the DEO, but what will that say about the need for guns? He said they wanted to do without them. Using semantics like that would be a cheap trick. I'm still trying to get my head around Alura not aging. Why do I get the feeling all isn't as it seems with Argo. I'm beginning to question whether that is indeed Argo and Alura. It's odd that Kara hasn't noticed. The going away psrty was abrupt and lacked any real emotion. But does anyone actually believe Kara will leave for good? The show is called Supergirl? Wouldn't be much of a show without the star It may have worked more had it been maybe a series finale wondering if Kara would go back home or stay on Earth. There is no connection between this Alura and Kara. I don't know if it's deliberate on the writers part or just lacking chemistry between the actors. Thank goodness for that robot stopping Kara from making a huge mistake. Of course she's not leaving. As you point out, not much of a show if she does. Disarming the DEO just doesn't make sense; I'm guessing the writers want comment on the gun control debate in the US. If, as jelgate suggests, they're just going to replace projectile weapons with alien high-tech weapons, I'll say it's just a cheap trick. A Gun is a gun. As far as Alex and adoption, that tracks. She broke up with Maggie for that reason a while back, I'm not surprised she's looking at it. Oh, and one other reason we can be sure SG/Kara is not leaving. They're clearly going to hook her up with Mon-El again. Which doesn't track. I would have though she was smarter than that. The interactions between Alura and Kara have lacked substance. It's flat and emotionless. It never felt like that when Laura Benanti was on the show. Yeah disarm a military organisation who fight powerful Aliens. What could possibly go wrong. They gonna talk them into submission? Guess she isn't that smart after all. Thank goodness for that robot or she would have been getting it on with a married man.